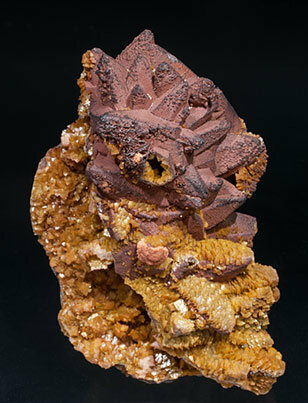 Irregular aggregate of deformed rhombohedral crystals with slightly curved faces and edges. They are completely transparent, with a nice, very intense and uniform blue color (really unusual for the species) and they are on matrix. The sample has been analyzed and we’ll send a copy of the analysis to the buyer. 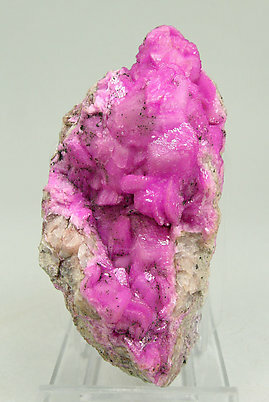 Groups and single rhombohedral crystals with very well defined faces and edges, and with intense and deep color, on matrix. Group of flattened rhombohedral crystals that are almost lenticular, of exceptionally intense color. On matrix. A very esthetic specimen. 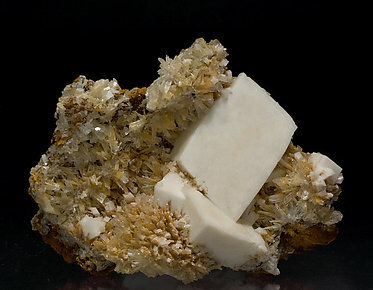 This Dolomite, of an attractive color, is partially covered by Marcasite cockscombs, and these covered by Goethite. The specimen caught our attention and we analyzed it to be sure about the identification. We will send the analysis to the buyer of the piece. Aggregates of very well defined Dolomite crystals with the well known “saddle” shape. They have a snowy white color and are on a rocky matrix. A Swiss classic from a single find when the tunnel was under construction. 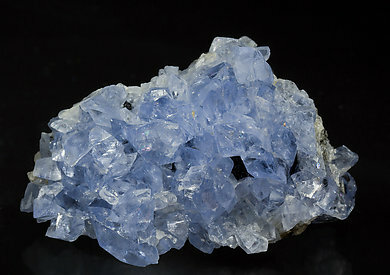 Group of very sharp rhombohedral crystals with interpenetration twins, transparent, very bright and with phantom growths that have a violet-gray color. A very fine Spanish classic. 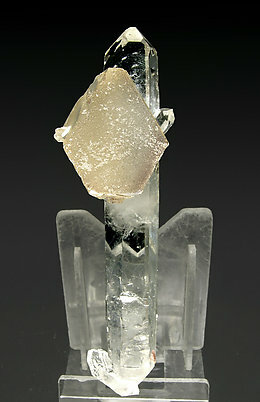 Druse of crystals with dominant rhombohedron faces. They are translucent and extraordinarily bright. 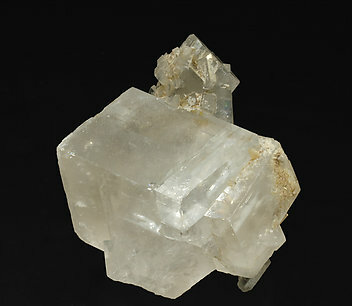 Aerial group of sharp rhombohedral Dolomite crystals that are twinned and bright, between transparent and translucent, with phantom growths and fine alignments of black globular growths, probably Graphite, a Spanish classic. Floater, complete in all sides, twinned, sharp, gemmy with zoned phantoms. A quality specimen of the classic Eugui Dolomites. 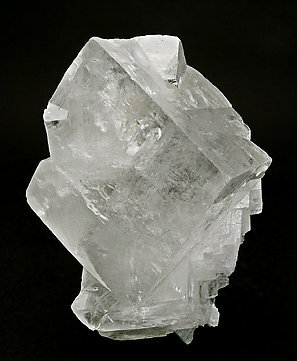 Twinned rhombohedral crystals with the usual quality for Eugui, with very well defined faces and edges, from transparent to translucent and very bright. A Spanish classic. 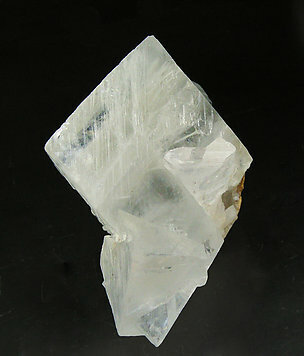 Aerial group of translucent and bright rhombohedral crystals. The Folch collection records note that is was collected by F. Coma October 1959. 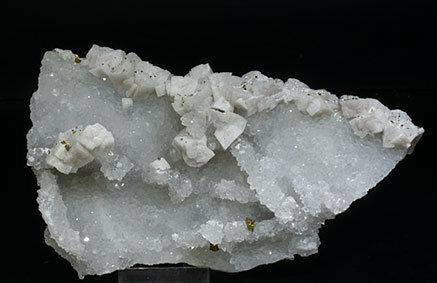 The crystals of this aggregate have great clarity and brightness, with inner iridescent inclusions. The interpenetration twin is apparent in different zones on the specimen. 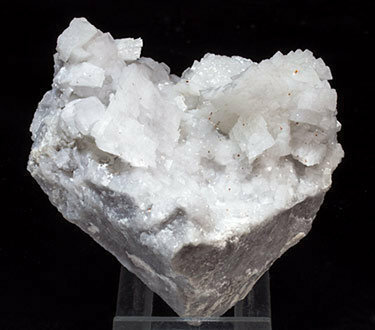 Aggregate of Sharp, white rhombohedral Dolomite crystals. They are translucent and have very well marked phantom growths. 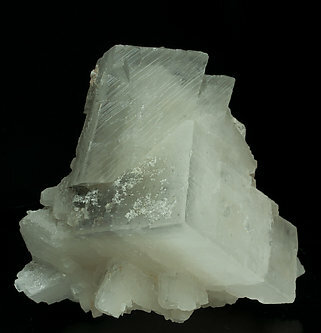 Group of sharp twinned rhombohedral crystals on matrix with very well defined faces and edges. 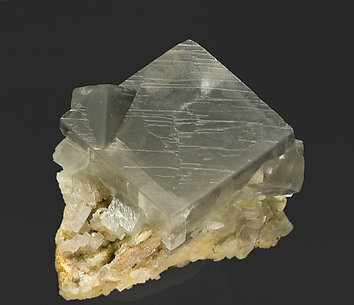 The main crystal has a curious geometrical zoning that leaves one of its quadrants completely clear while the other three have gray inclusions. The sample comes from the Museum of Luxembourg (register CK015) whose label will be sent to the buyer. A curious specimen. 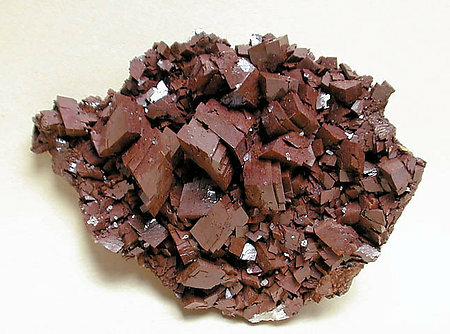 It is a Dolomite totally covered (but not pseudomorphosised) by a thin chocolate cover of iron oxides. First impressions when you look at the specimen are: nice Siderite! 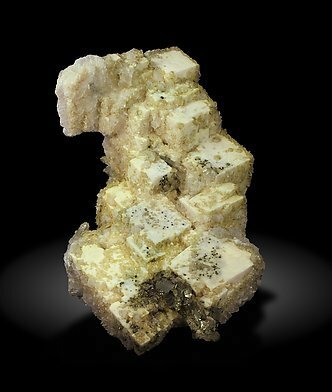 When you look more carefully you will discover that the primary crystals are really white curved Dolomite crystals totally covered by a lustrous, brilliant, colorful coating. Something different! 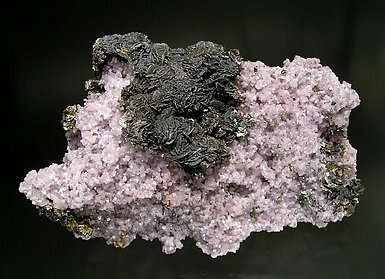 Aggregate of scalenohedral Calcite crystals, on matrix, with red Hematite inclusions. 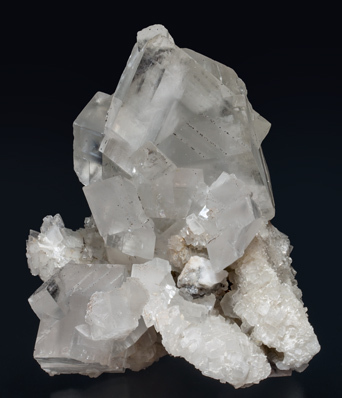 The Calcite crystals have internally dissolved leaving only remaining the former crystal form. 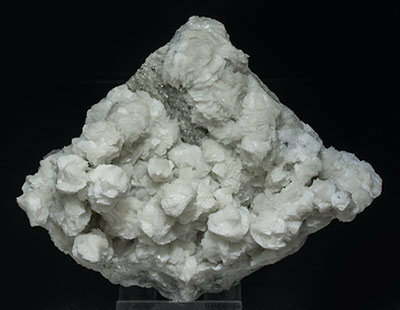 Both the matrix surface and the cavities on it, including the interior of the Calcite crystals, are coated by small Dolomite rhombohedrons. As is the case with so many specimens in this collection, the sample is of great quality for the locality. 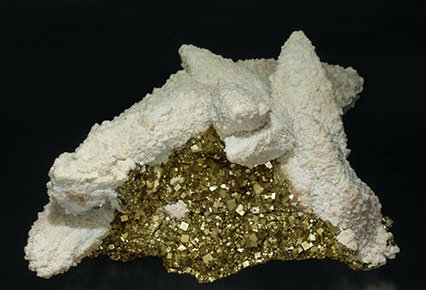 Aggregate of small rhombohedral Dolomite crystals pseudomorphous after large scalenohedral Calcite crystals on a matrix with very sharp and bright cubic Pyrite crystals. An Italian classic. 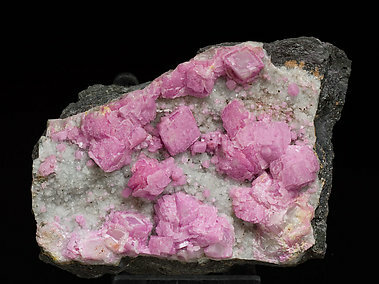 Slightly deformed rhombohedral Dolomite crystals with a pale-brown to pinkish color, with small twinned Chalcopyrite crystals on their surfaces and on a base of Quartz crystals with a very poorly developed prism. It is an excellent German classic for the species and the locality. As is the case with so many specimens in this collection, the sample is of great quality for the locality. 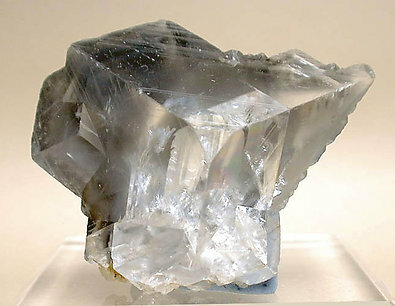 Groups, on a rocky matrix, of very Sharp rhombohedral crystals with polycrystalline growths, bright and with a snowy white color. 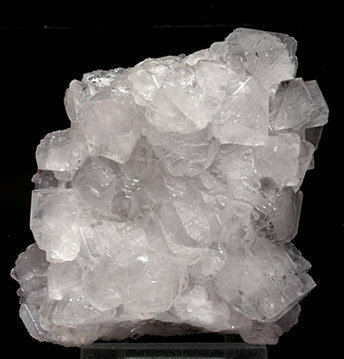 Thick tabular crystal tabular formed by dominant pinacoid faces and those of the rhombohedron, giving it a hexagonal shape. 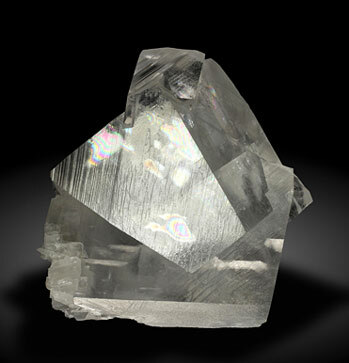 The frosted crystal is implanted on a neat and bright, doubly terminated, prism of Quartz. 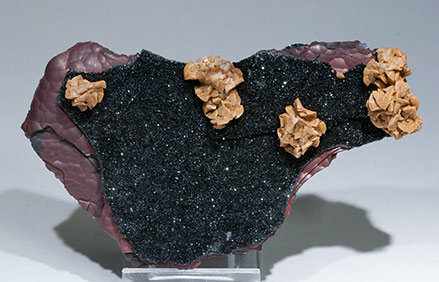 Aggregates of saddle-shaped Dolomite crystals on a matrix of botryoidal Hematite coated by a thin layer of very small lenticular crystals of the same Hematite. The sample is with labels from the J.F. Lanoë collection and the Stoppani collection. As is the case with so many specimens in this collection, the sample is of great quality for the locality. 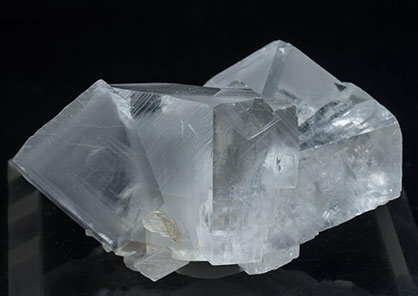 Very well defined rhombohedral crystals of simple forms, bright and with snowy white color. 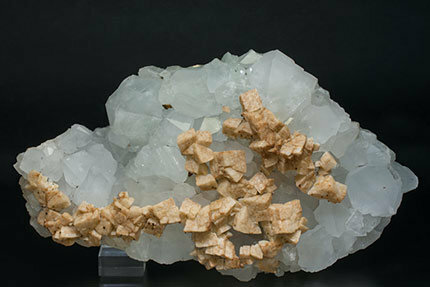 They are implanted on a base of flattened crystals of Hemimorphite, also very well defined, and on a limonite matrix. Such samples were quite common at the Ojuela Mine in the eighties.